Sparco Seat - Tuner Series - Speed UNIVERSAL - Dezod Motorsports Inc - Home of the automotive performance enthusiast since 2002. The Speed is an evolution of the world famous “Sprint” competition seat, which is one of the most popular seats in Sparco’s line. A joint technical partnership with Pirelli has developed a new internal support system that offers improved comfort and control. The Speed features the same high density injection molded memory foam found in the Torino and Milano. 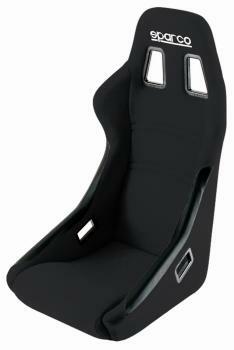 All seats are available in competition fabric, black Jacquard is also available. Sparco and Pirelli came together to develop an internal support system that offers improved comfort and control. Pirelli chemical research technicians engineered a high quality rubber compound exclusively for Sparco that absorbs vibration and assists in inertia displacement.